Why isn’t the editing function isn’t working properly? 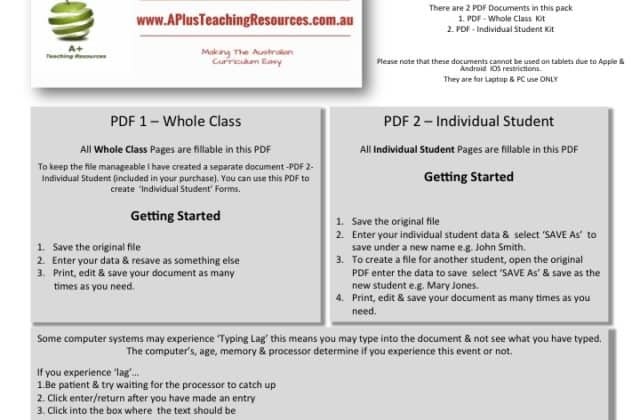 To add & save your class list into editable products you need to have the latest version of Adobe Reader DC downloaded onto your computer or laptop. If you don’t use this software to edit the product it will not work correctly! If you have opened your document and tried to type into it and you can’t, or if you cannot see your changes when you reopen your document it means you are using your browser preview to open & work in your product and not ADOBE READER DC. 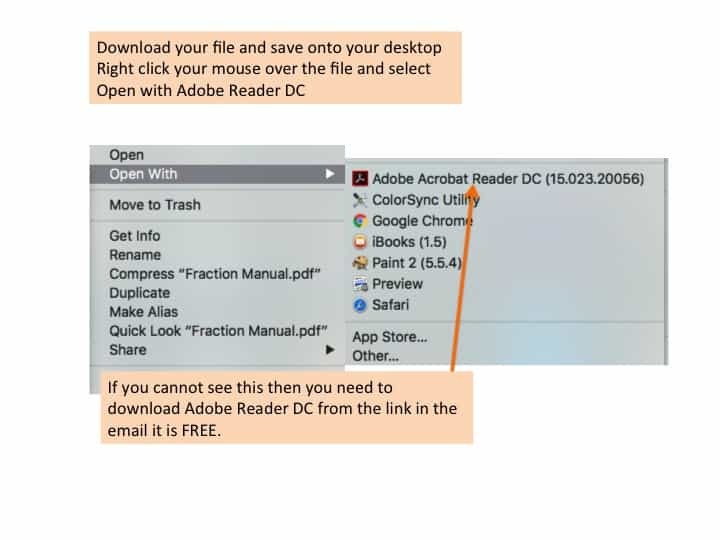 You need to save your document onto your computer and then reopen it using ADOBE READER DC…. Scroll down to read how to do this. I have Adobe Reader DC on my computer but my product still doesn’t work. To enable the form fillable, & save functions of editable products you need to make sure you OPEN the product using Adobe Reader DC. Many computers will open PDF files in your Web Browser or in a Preview mode automatically. This means that you will be able to see the product but you will not be able to use the product properly. Sometimes you may be able to start putting some information in but it may stop abruptly, or it won’t save the information. Again this is because the product has not been opened with Adobe Reader DC. To make sure you are opening the folder with Adobe Reader DC and not another version of Adobe you will need to right click your mouse over your product and select OPEN with>>>> Adobe Reader. 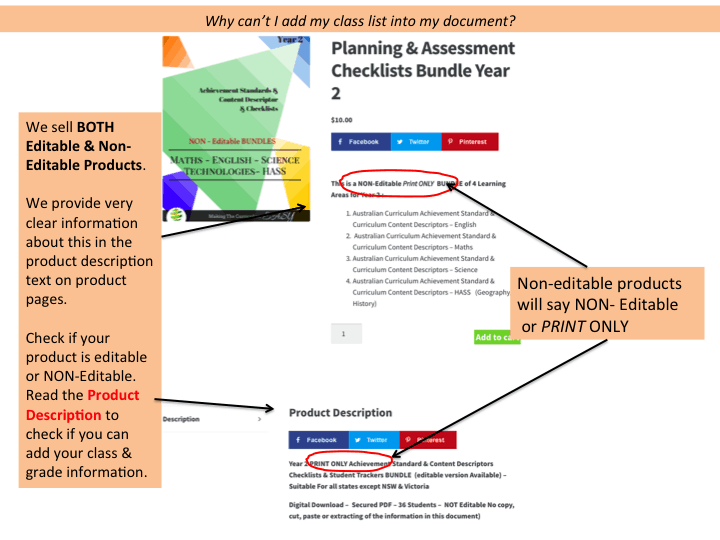 Why can’t I add my class list to my product? We sell Editable & Non-Editable Products to meet all our customers requirements. We sell BOTH Editable & NON-Editable products. 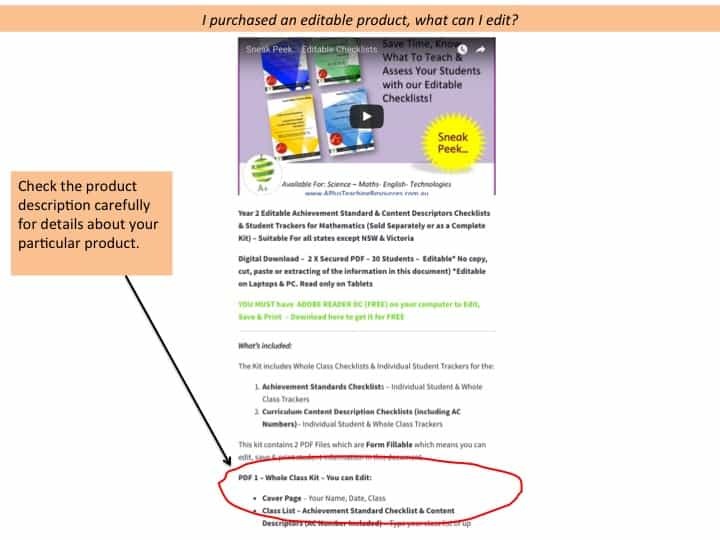 Please check that you purchased an editable product by referring to the product description page. 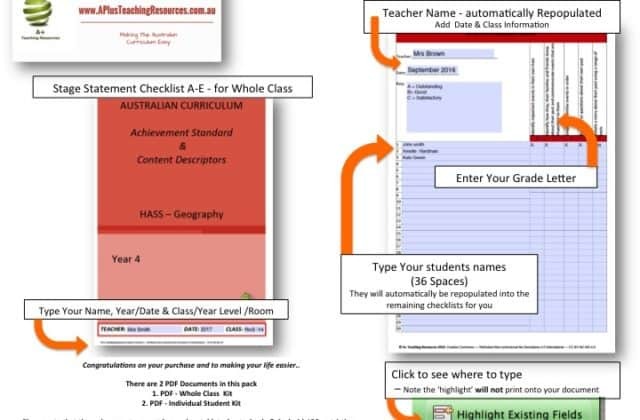 If you want to add your class to a document you need to purchase an EDITABLE Product. You can find out what you can and cannot edit by reading product descriptions. Find this information by searching for your product and clicking the product image, this will open up the product information page including product description. Error messages happen when your file has become corrupted. There is no Adobe READER DC on the device and another ADOBE product is being used to open the program. If you get this message or a similar one you can download a fresh copy of the file using the links in the order email we sent you. Alternatively you can email customer support for a new file and they will send it out to you as soon as they can. 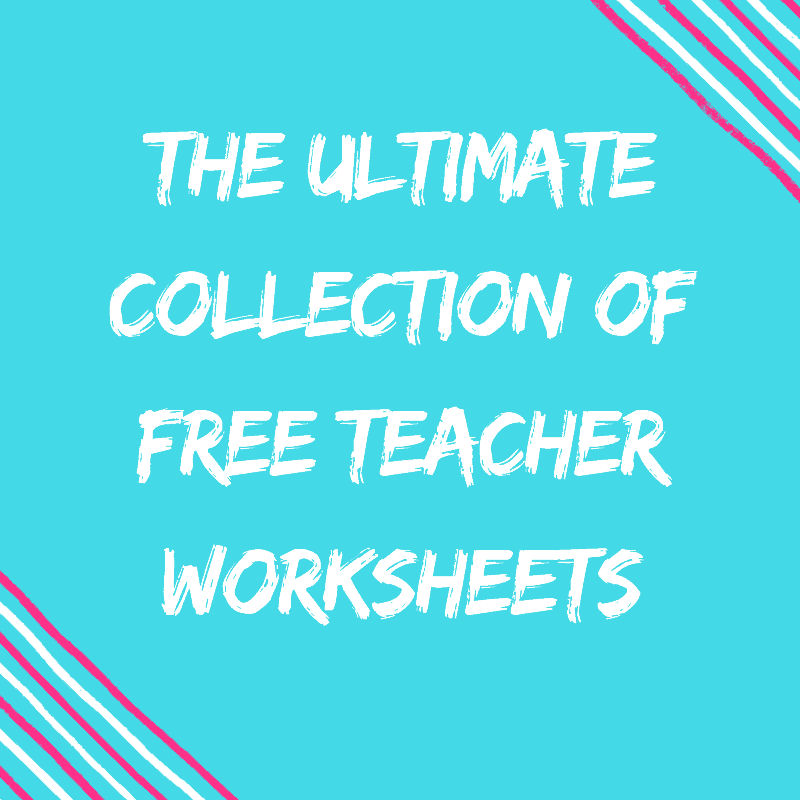 Please note that these files are large so if you want it emailed to you promptly check your inbox is not too full especially if using education department emails, or provide an alternative email address. You do not need to BUY Adobe to fix this issue Adobe Reader DC is a FREE download. When will I get my product links email? All links are emailed automatically and will vary in the amount of time it takes to be sent to you. You didn’t give it enough time for payment to be processed – This can take time and is beyond our control. To check if there is a payment issue review your Paypal/credit card statements. Check your Junk email folder – 99% of emails are here because we are not on your safe senders list. Your EMSP SPAM filter is blocking our emails- This happens depending on a number of things and is beyond our control. You will need to add us to your safe senders list. 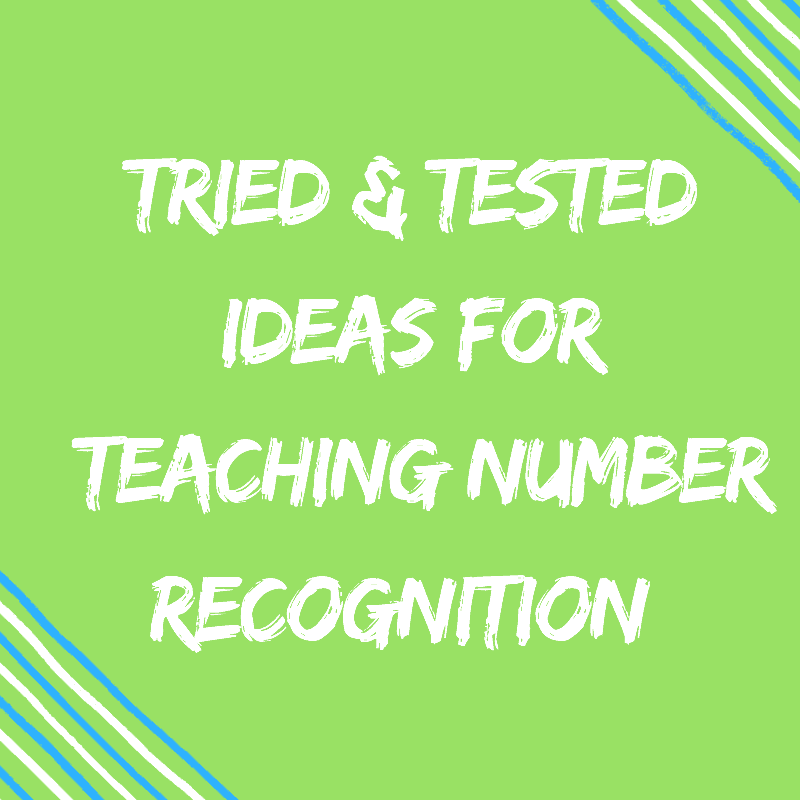 We find this is an issue with some Department of Education Email addresses, but not all! Contact Customer Care who will resend your links to an alternative email. 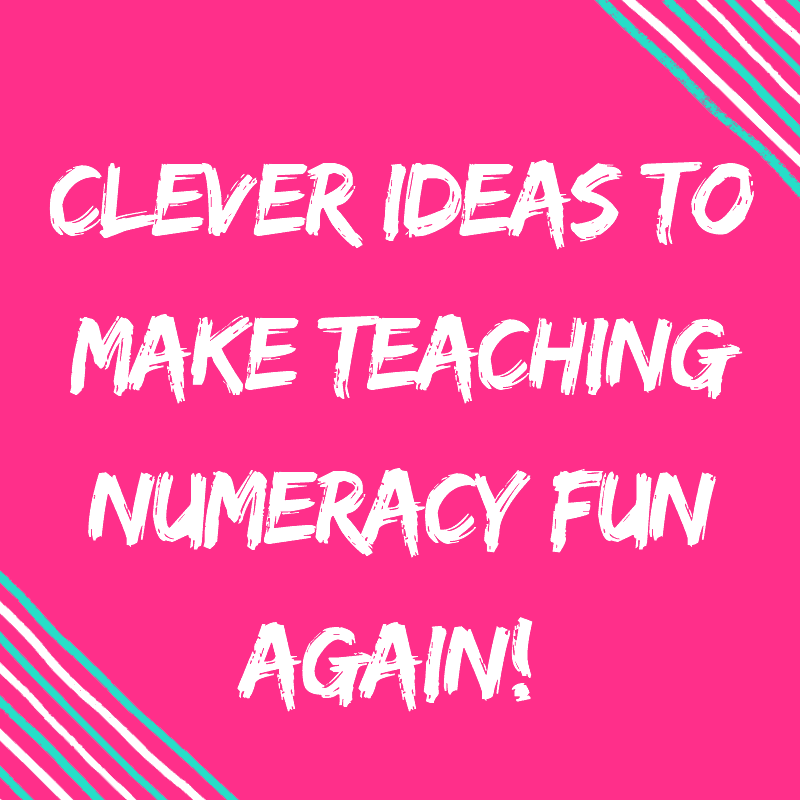 If you want to use your product at school you can forward the email to your work email at a later date. My product downloaded as a PDF not a word document. 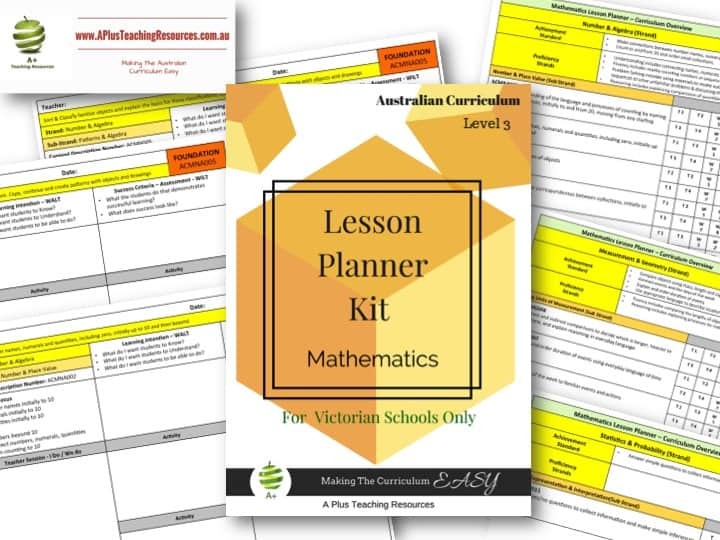 All our products are Editable PDF. We do not sell word documents. 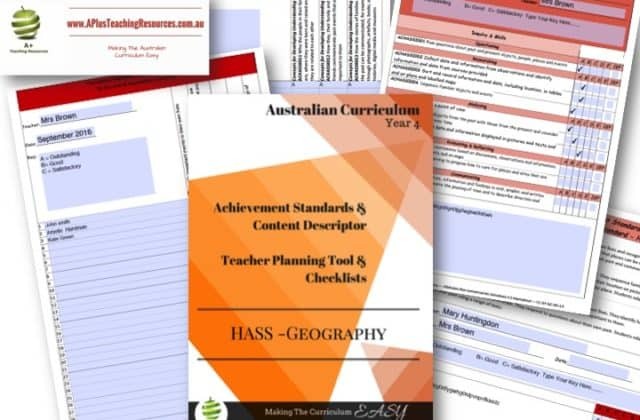 To protect the copyright of our products all our resources are secured PDF. 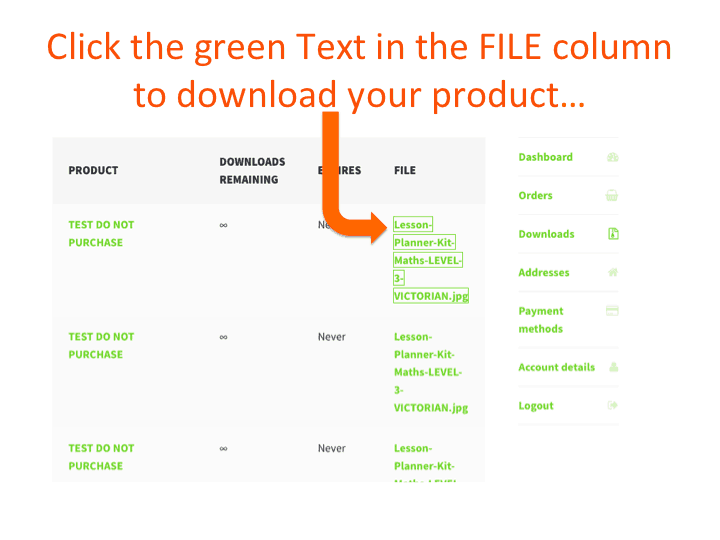 You will not be able to extract, copy, cut, paste or change text in our products. Computer default settings not opening with the new version of Adobe just downloaded. I purchased an editable product, what can I change? Editable Products are clearly described in the product description. 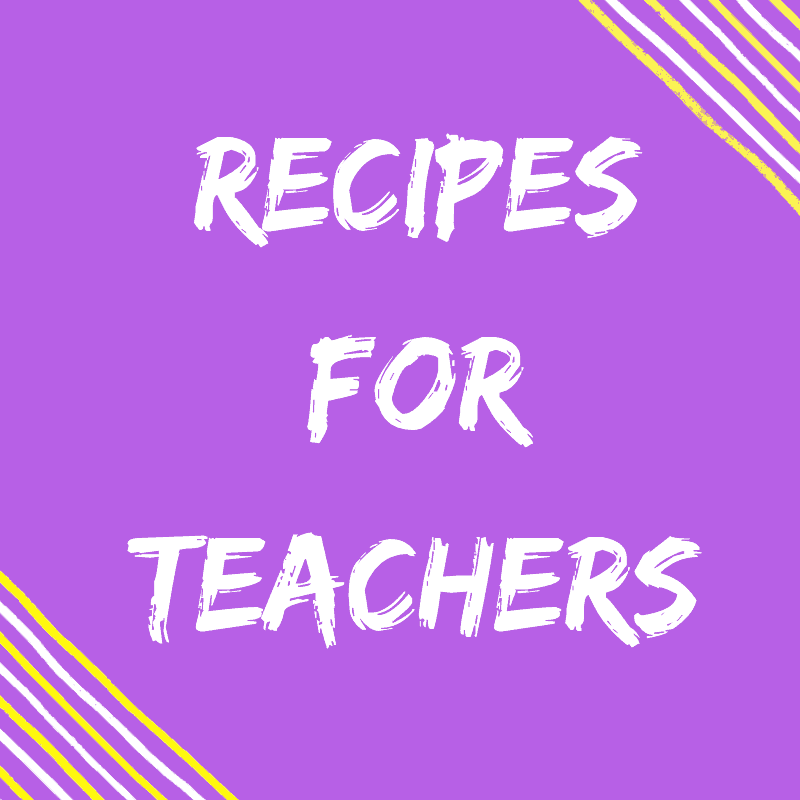 Editable products have special form fillable areas where you can add details, class lists, grades or lesson plans, depending on which product you purchased. Read the product description carefully to see what you can edit. How do I type into my product? 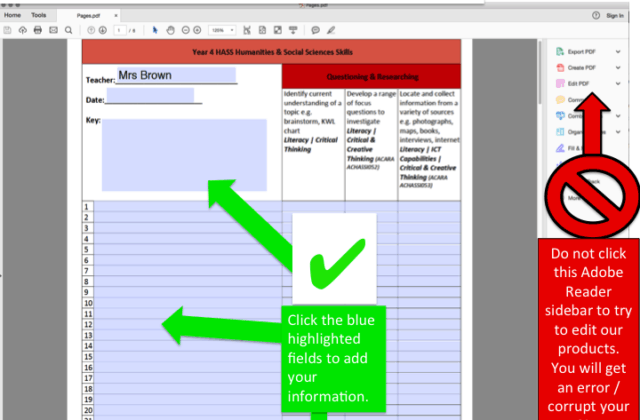 To enter you class details and information just type into the ‘blue highlighted’ fields in the document. 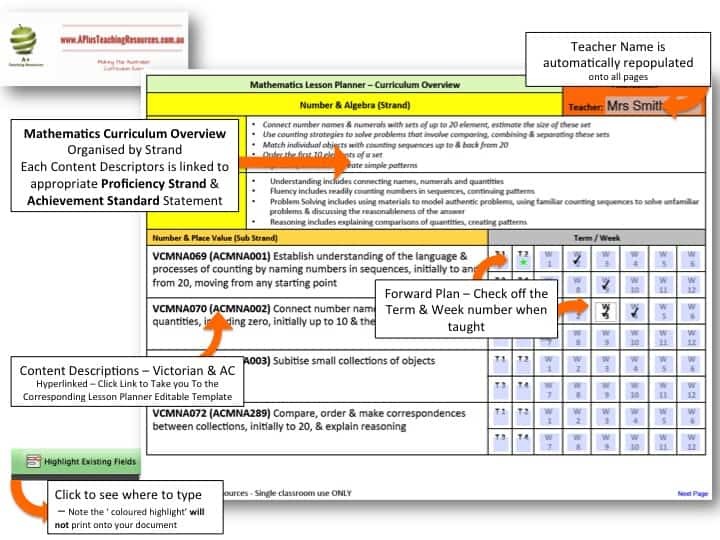 All you need to do is type your information into the ‘Highlighted fields’ in the document, they are highlighted blue. These fields are the only place you can type into the document. If the field you want to type into is not highlighted you need to open the other file in the kit, there are 2 Kits in some products. We do include instructions in each product. you can also see a preview of each product in the product description to shoe you or see our ‘How To Videos’ if you need further assistance. You cannot use the Adobe side bar editing tool to edit our products. Do not use it in our documents or you will not be able to edit the file and you will get an error message and may even corrupt the file. If you get an error message close the file and start from scratch or if the file is corrupted re-download the file again using the original email links. APTR accepts payments by Credit Card & Paypal. Once you’ve added the resources you want to purchase into your cart, click “View Cart” and then select “Proceed To Checkout.” At checkout, you’ll be able to select the payment option of your choice and follow then select “Place Order” to complete your transaction. We do not accept any other methods of payment. ‘View Cart’ this will take you to the checkout page. ‘Proceed To Checkout’ to enter payment details. 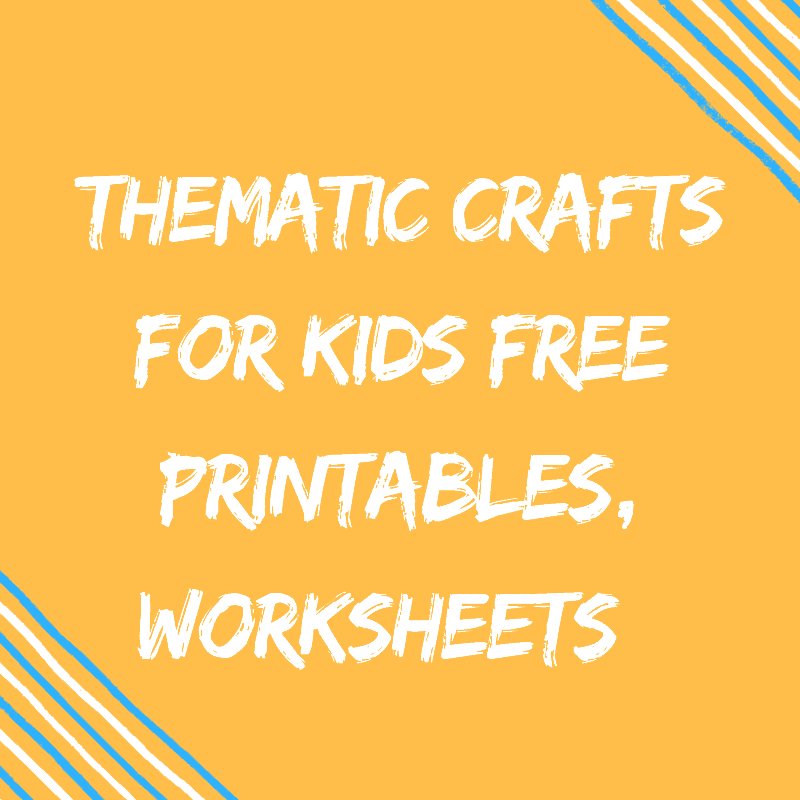 All products are digital downloads. They are not physically mailed to your home. There are 2 ways you can download them. After your payment has been processed you will be shown a ‘Order Received’ page. It shows your order number, date, total spent and customer details. 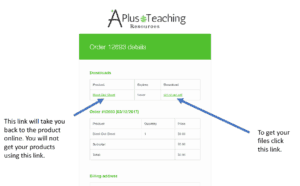 Your ‘Order Details’ are also shown, including the products you have purchased. If you want to download them immediately just click the green text ‘DOWNLOAD‘ (not the title of the product… this will take you back to the shop ) and save your download onto your computer. Your product links are also emailed out to you using the email address you provided at the checkout. So if you are not at your computer at the time of your purchase, don’t worry you can download them later at a more convenient time! 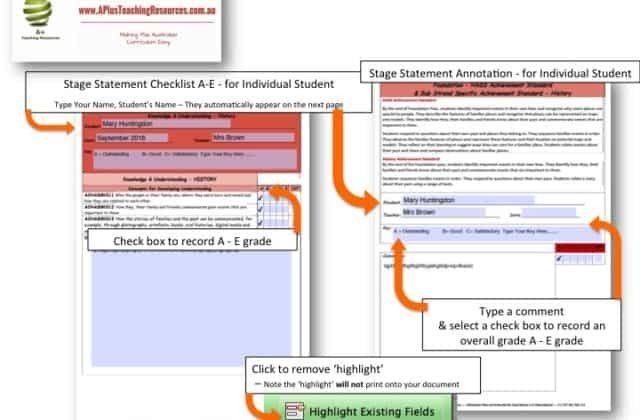 After payment is finalised you will be emailed a ‘Your order is complete-download files’ email. This email also contains your download links to your products. 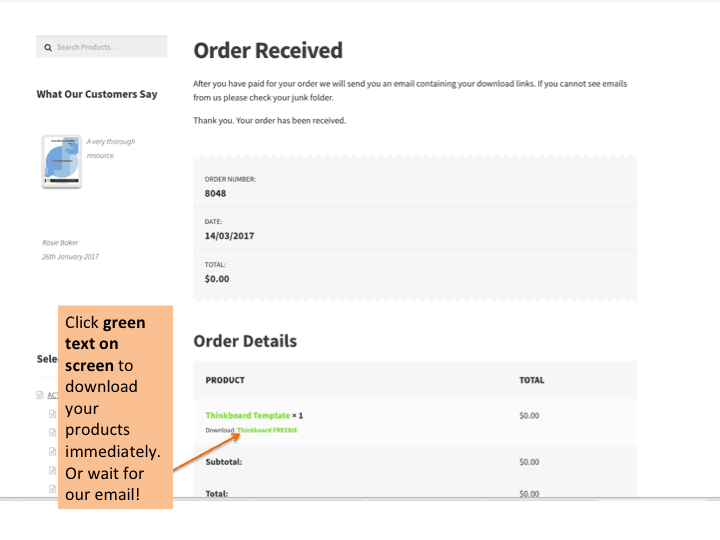 Download your products by clicking the Green underlined text under the word “Download” not “Product”. If you click the word product you will be taken back to the web page where you bought it from. If you have purchased more than one product you will need to click all links. Once you have clicked the link your computer will put out a dialogue box asking you where you want to save the files. Please take not that your default setting will automatically save your products to your ‘Downloads Folder’ on your computer. You can also select your own destination before clicking save, we suggest you ‘SAVE’ to your ‘Desktop’ then move them to a folder of your choice. 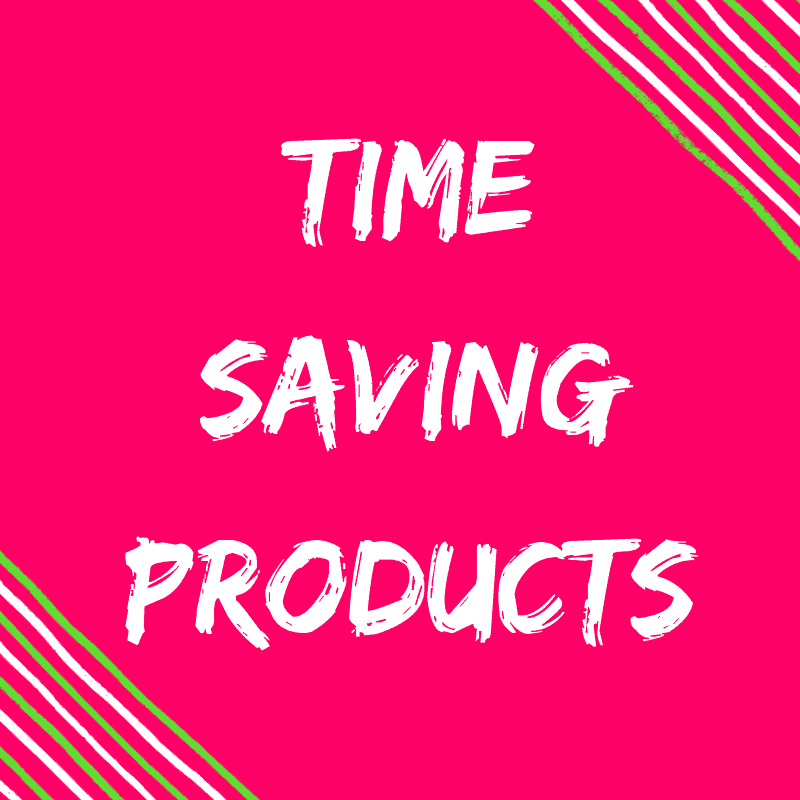 Do I need to purchase additional expensive software to use these products? No. 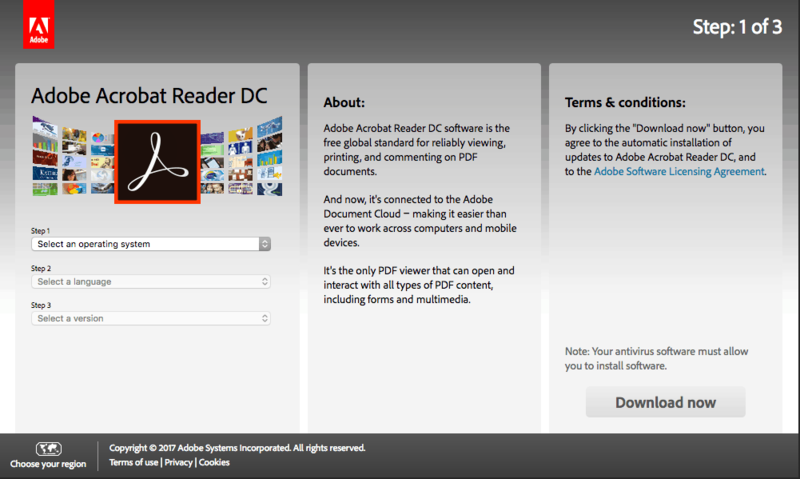 Our products use the FREE version of Adobe Reader DC. You do not need to buy any expensive programs to use our products. But you MUST have an up to date version of the correct ADOBE product on your computer or laptop. Adobe make lots of different programs and you may have some of them loaded onto your device. If your default setting opens your product with the incorrect program the file can become corrupted and will not work. Make sure that you OPEN the editable files with Adobe Reader DC. This is the only program that will allow you to edit & save the changes you make in our editable products. No! You don’t need to have an account to access downloads from this site. But there are added benefits of having one! 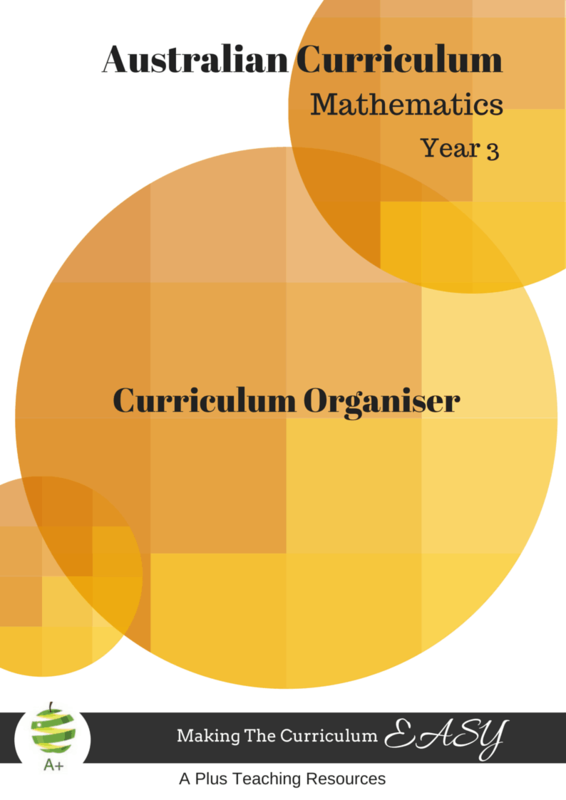 You do not need to create an account to access the resources on this website. However if you create an account your downloads will be instantly updated whenever a change is made to a document. 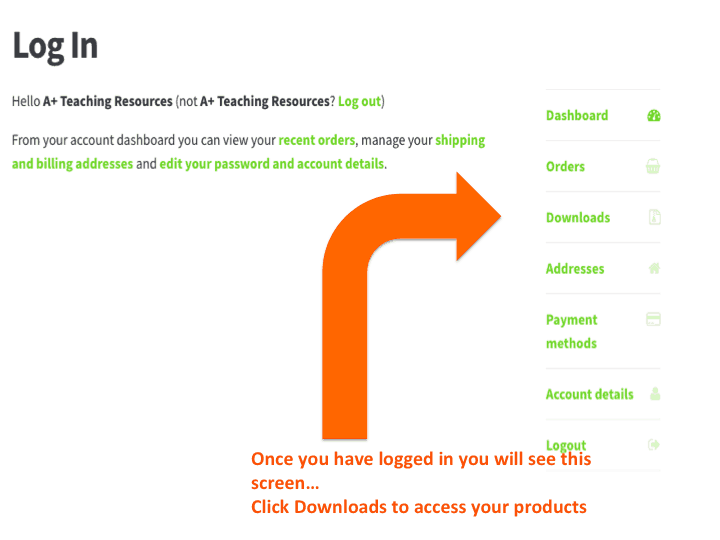 It is much easier to manage and access your downloads when you have an account. They will never get lost in email firewalls or spam folders and it’s Free to create one. The perfct way to keep all your downloads together and links. Make an account here. Can I use my product on my ipad? Apple & Android devices do not support secured PDF files at this time. You will only be able to read the documents on tablets, not edit them. At the moment Apple & Android software only allows for unsecured PDF files to be edited on tablets. Secured form fillable documents cannot be edited on tablets. You will only be able to read your secured PDF’s on this type of device until this feature is updated by Apple or Android software developers. 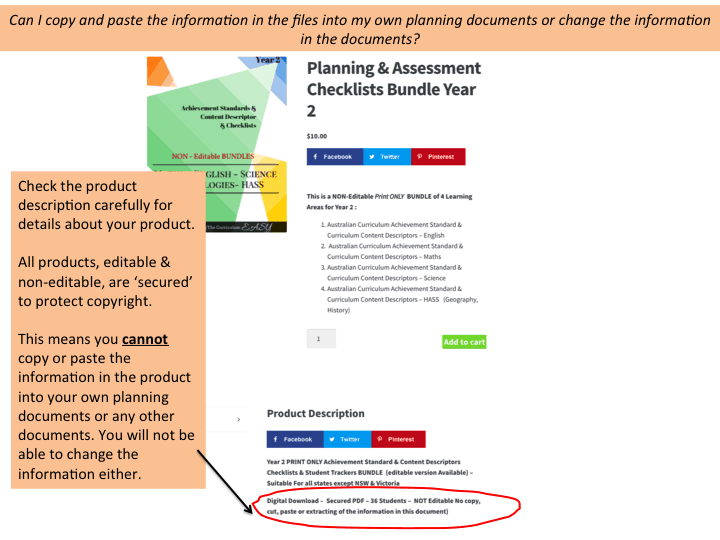 Can I save, copy & paste, or change the information in the products into my own documents? All products are copyright protected. This means that you will not be able to copy& paste, or change any of the information in the documents. Check the product descriptions carefully for details about your products. All products regardless of being editable or NON-Editable, are clearly described as ‘Secured’, this is to protect copyright. 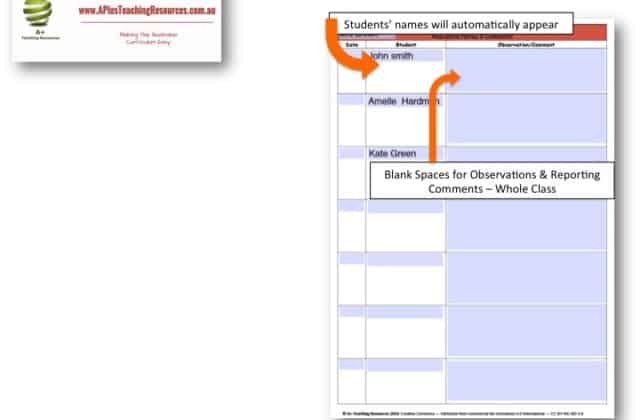 It means that you cannot copy or paste the information into your own planning documents or into a blank document. You will not be able to change the information in the files in any way. My product is editable what can I change? The same copyright restrictions apply to editable products. 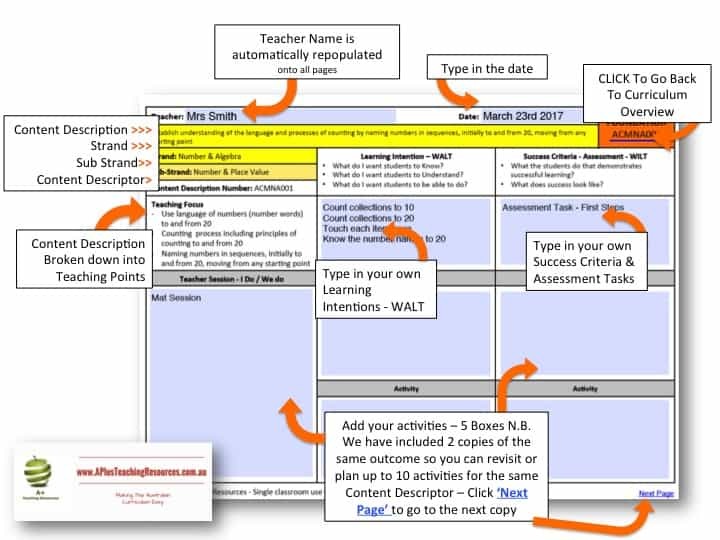 Editable products have special form fillable areas where you can add details, class lists, grades or lesson plans, depending on which product you purchased. Read the product description carefully to see what you can edit. Can I Download My Products in My Account? Yes! 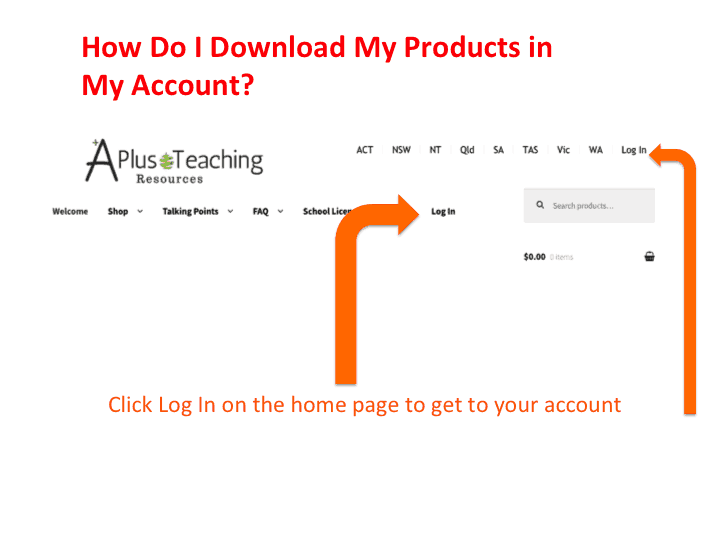 You can Download Your Products on your Dashboard if you have created an account.